The Shimanek Covered Bridge was constructed in 1966. It is painted red with white trim and is kept in good repair (from external appearances). It bridges Thomas Creek, which is crossed by Richardson Gap Road. The bridge is pictured looking to the south from the north side of the bridge. Turn Left (North) onto Richardson Gap Road. On a clear day you may be able to see the red color of the bridge shortly after making the turn. Drive for less than a mile to Shimanek Covered Bridge. 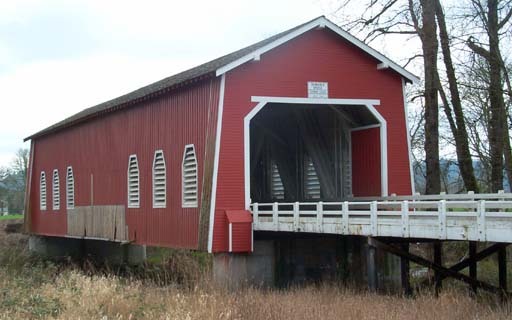 Next stop on the Scio Covered Bridge Tour: Hannah Bridge, Scio, OR.